Imagine that you are having an excellent time diving somewhere in the warm and blue waters of Mexico. Wouldn’t it be nice if you did not have to worry about how deep you can dive before you would start to get decompression sickness once you get back to the surface? A dive watch computer would give you these information, which you can read just by glancing at your wrist. After much searching, the top pick was chosen to be the Cressi Leonardo Scuba Dive Computer Wrist Watch. This computer watch is ideal for divers who are just a novice or for people who just enjoy diving. The user can effortlessly change between the Air, Nitrox and Gauge modes just by pressing a single button. The watch has a High-Definition screen with large numbers which allows the user to easily view the information on the wrist. 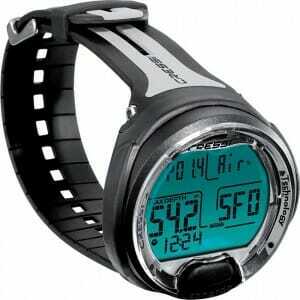 If you have some more money at your disposal, then you can go for the Oceanic Geo 2.0 Air/Nitrox Computer Watch. The watch would let you choose between two algorithms and has a user-friendly feature called “Step Back”, which lets the user go forward and backward through the different features and settings that are present on the watch. The watch even does calculations based on up to two different gas mixes, which you can switch in between. The Geo 2.0 has Firmware Auto Update, which would make sure that you are getting the most out of your dive computer. If you are not willing to spend too much money on a dive computer watch, then you can have a look at the Pyle Waterproof Underwater Snorkeling and Diving Multi-Function Water Sport Wrist Watch. The Pyle Waterproof watch is definitely one of the cheapest watches of its kind that is available on the market. But the watch does not skimp on features. It can keep up to 100 records of starting time and date, dive duration, maximum dive depth and water temperature among many other useful information. The watch even has a dive alarm which will sound if the person is approaching at a speed greater than 6M/minute. How does a dive computer ensure your safety? Scuba diving is one of the most popular recreational sports around the world. According to a paper from The Diving Equipment and Marketing Association (DEMA) in the US alone there are between 2.7 and 3.5 million active scuba divers, with the number becoming 6 million when the worldwide population is taken into account. When it comes to snorkeling, the US has 11 million enthusiasts, with 20 million fellow enthusiasts worldwide. For Florida, snorkeling brings in a revenue of $2.1 billion, with a contribution of $11 billion to the US gross domestic product. As salivating as the prospect of swimming between beautiful coral reefs and eerie shipwrecks is, people need to be aware that scuba diving is an extreme sport with the potential for causing some peculiar injuries, along with some life-threatening hazards. According to a report titled “What Are the Dangers of Scuba Diving?” which appeared on the USA Today newspaper, the elevated water pressure under the sea is the factor most responsible for most of these injuries and hazards, but faulty equipment is also an important factor. Some injuries that can happen to divers are listed below. Barotrauma- This is caused when the increased water pressure causes damage to the air pocket in the middle ear. Divers will usually try to prevent this by trying to equalize the pressure between their ears and the outside environment, which they try to do by squeezing their nose and blowing out, by chewing or swallowing to put more air into the middle ear. However, if the descent is too rapid, a diver’s ability to equalize is compromised which can result in painful injuries, resulting in the middle ear getting damaged in worst-case scenarios. Decompression sickness- Often known as “the bends”, this is caused by the tissues of the body absorbing more nitrogen as a result of the increased pressure under the water, with the nitrogen bubbling out on a sudden reduction of pressure, with some potentially harmful results. Hence deep divers return to the surface in carefully monitored stages to counter the effects of decompression sickness, which can range from minor inconveniences like skin rash and aching joints to more harmful health problems like paralysis and even death. Nitrogen Narcosis- The extra nitrogen in the blood can have a narcotic effect on the body, which can impair sensory perception and judgment and hence can be dangerous. Similar to decompression sickness, the depth a diver goes determines the level of nitrogen narcosis that can occur. Pulmonary Embolism- The gas that the diver is breathing becomes denser as the diver descends into the depths, making the diver inhale more gas per breath. These gases will enter into the lungs, which will not be a very big problem under the increased pressure, but during the ascent to the surface, the reduced pressure on the lungs means that it will expand, and can even explode like a balloon. This can be avoided by not making a rapid ascent to the surface and never holding the breath. Sea life- The diver is essentially invading the environment that belongs to the sea creatures, so it is imperative that some of the creatures present under the sea will display hostile behavior towards the driver. Though incidents of people being attacked by sea creatures on a scuba diving trip are rare, it does happen, so a diver always has to take the necessary precautions. Defective equipment- Most divers will rent their equipment from scuba diving operators conducting their trip, so it is very important for the diver to check if the equipment supplied to them works properly or not while still on dry land, and never be hesitant about asking for a replacement if they suspect that their equipment has some problem. If not addressed at the right time, malfunctioning equipment can lead to anything from a mild case of decompression sickness with a broken depth gauge, to drowning with a bad regulator. Accurate recordings- Recording an accurate information on bottom time and maximum depth is one of the greatest challenges that a diver can face. The inaccuracies in this information results in faulty dive table calculations. Dive computers will constantly keep track of the depth and time of the diver, thus eliminating the concern. Decompression status simplified- Using dive tables to manually calculate the decompression status is cumbersome and prone to error. The dive computers have the ability to perform all these calculations constantly based on the information on depth, time elapsed and no decompression time that the computer gathers based on the current profile of the diver. On the event that a diver does end up in a decompression situation, the decompression time and ceiling depth will also be calculated by most computers. Indicators for ascent- Every person who goes for scuba diving is taught to ascend slowly and never exceed the maximum rate that is calculated from the dive table, exceeding this rate will result in the diver suffering from decompression sickness. Every dive computer has an ascent rate monitor or warning mechanism, which will allow the diver to constantly monitor his/her ascent rate, and slow down if the ascent rate is too fast. Dive computers with warning mechanisms will warn the diver by beeping if the ascent rate is too high, typically above 60 feet per minute. Added advantage with added features- Dive computers which are air integrated will provide further information apart from the depth, time and decompression status information. Air integration will allow the diver to monitor the air pressure in the cylinder and air time remaining information, which the computer calculates based on how fast the diver is consuming air from the tank, the capacity of the cylinder and the depth. The information on the amount of air available to the diver is a very crucial information which will allow the diver to decide how far he/she will dive. So how would you choose the correct dive computer from the large number of computers available? The first thing you need to do is determine what type of diving do you do, or what type of diving do you plan to do in the future. If you already own diving equipment, you would need to worry about whether the dive computer would be compatible with your diving equipment. Once you are actively searching for a watch, you have to look for the appropriate display on the watch. You would have to determine if you can see the watch display with your mask on, whether the data displayed on the watch makes sense to you and whether you prefer numbers or a more graphical display and whether you can easily find out the data that is most relevant for your purpose. And lastly, do not be miserly while selecting a dive computer watch. Once under the water, a good dive computer could be the difference between you enjoying your dive, or ending up with a painful injury. Once you have bought the computer, how would you make sure that the device lasts a long time? Make sure that you acquaint yourself well with the different functions and features of the watch by reading the instruction booklet that comes with the computer and pushing all the buttons. You can set up some preferences on the computer watch like the time and date, the units that would be more convenient for you imperial or metric. When you have finished diving wearing your computer watch, make sure that you rinse the device with fresh water. Keep the watch out of direct sunlight, especially the display, and keep the watch in a cool and dry place when you are not using it. Make sure that you do not drop the watch unit too often or try to damage it in other way. Regularly check the battery status of your watch, and change the battery or recharge the watch as would be described in the booklet provided by the manufacturer. The large numerical display on the High-Definition LCD screen of the wrist watch makes it easy for the user to see the information being displayed. The Battery Life Icon Indicator right on the display will allow you to easily see how much juice is left in your computer wrist watch battery. The watch has a new RGBM Algorithm which will calculate the Safe Decompression Calculations over multiple dives performed over multiple days. The multifunctional watch will supply information on depth, dive times, decompression status, ascent rate and the surface interval times between dives. You can even view the nitrogen absorption and decomposition status on the large watch display, which is continually processed after taking into account the different possible ratios of inert gases in the mixture. The watch display even has a backlight feature, which would allow you to see the display even in low light conditions. The PCD (Priority Compartment Digit Display) System allows a direct communication between the diver and the computer, showing the precise data that the diver might need in order to complete the dive successfully. The computer has a clock and calendar, a dive memory which can store the information of up to 60 dives, or 70 hours worth of diving, and a dive simulator. The operational depth of the watch is 0′ to 393′ (0 to 120 meters). It is easy to operate and if you are someone who has never used a dive computer before, the manufacturer offers a free online class to acquaint you with the various features of the computer watch and how to get the most out of it. The Oceanic Geo 2.0 Air/Nitrox Computer Watch has a very user-friendly interface, which has been named as the “Step Back” feature, which enables the user to navigate through the different menus and settings in the watch both forward and backward with ease. The watch has Oceanic’s Exclusive Dual Algorithm feature. This gives the user the choice between what algorithm they would prefer to calculate their decompression status, the Pelagic DSAT (Spencer/Powell data basis) or Pelagic Z+ (Buhlmann ZHL-16C data basis). The watch has four operating modes: the watch mode allows the user to use the dive computer as a normal watch and as a chronometer, alarm clock and countdown timer, the norm mode allows for calculation of the amount of air or nitrox remaining in the tank when the user is out scuba diving, the gauge mode keeps track of the amount of time spent underwater, and the free mode keeps track of the different calculations going on in the computer so that the transition between the norm mode and the free mode is seamless. The watch lets the user program up to two different ratios of air mixes in the nitrox mixture, so that when you are out scuba diving, you get an accurate idea of the time that you are supposed to start your ascent. The watch would give you access to the maximum depth and bottom time of your last dive simply with the press of a button, and the watch can store up to 24 such information in its memory. The watch has Firmware Auto Update feature, which will allow you to download and install the latest updates and new features through the PC interface. The Pyle Underwater Snorkeling and Diving Watch has a special dive-ready design and has water resistance of up to 10 atmospheres, which is a depth of 330 feet. The watch can measure your depth up to a resolution of 0.1 ft. The watch has a dive alarm feature which will activate if you are ascending at a rate which exceeds 6 meters per minute. You can even be informed about the temperature of the water surrounding you because the watch is equipped with a thermometer which can measure the temperature of the water correct to 1 degree Celsius or Fahrenheit. The watch has the capability to work in a temperature range of 14° and 140°F (-10° to 50°C) and in both fresh and salt water. The watch is capable of storing up to 100 dive data, which will include the time and date of the dive, the duration, minimum water temperature and dive site indication. The Electro-Luminescent Backlight Display will allow you to see all these information easily, even in the dark thanks to the button-activated illumination backlight. The Suunto ZOOP is a perfect watch for those people who are just starting to dive, because of its easy to use menu coupled with some safety features. The watch has the ability to operate in two modes, Air and Nitrox, which can give the diver better estimate about decompression status. The watch is programmed to use the Reduced Gradient Bubble Model (RGBM) to calculate the decompression stops of the diver, how much gas has accumulated during a dive and how much time is required for you at the safety stops to safely ascend to the surface. The manufacturer has been incorporating this model into all of its dive watches, striving for RGBM perfection with each iteration of dive watches. The Suunto DM5 interface will allow you to download the dive information onto a PC, thus allowing you to perform advanced analysis on the data and use the data for planning future dives. The watch will work up to a depth of 330′ (100 meters). The watch provides a temperature reading with a resolution of 1.5°C above and below the surface and is altitude adjustable up to 10,000 feet (3,000 meters). You can program the dive computer for Nitrox mixtures containing 21% to 50% oxygen and displays oxygen partial pressures from 17.4 psi to 23.2 psi (1.2 to 1.6 bars). The Cressi Giotto Wrist Watch utilizes a new algorithm which has been created based on the Halden model and it is integrated with RGBM factors which allows the watch to perform safe decompression calculations over dives that can be repeated day after day, and with the same air mixture. The diver will discover that the watch is very easy to program the three modes of Air, Nitrox and Gauge when first picked up by using the three-button interface. The dive computer software can handle two different hyper-oxygenated mixtures, which can be selected by the user during the dive. The computer also has a “Dive” program, which allows for a full processing of the dive data for every dive performed with Air or Nitrox, even decompression data if that is available. The user can easily plan for a dive in advance by scrolling through the different decompression curves. The oxygen partial pressure can be set between 1.2 and 1.6 bar, and the oxygen percentage can be set between 21% and 99%. The Mares Puck Wrist Dive Computer Watch has a wide display on the watch with very bright backlighting and high contrast in addition to the digits themselves being oversized. This allows for easy readability of the information being shown on the display. To eliminate angular distortion and produce the watch with the best visibility, special attention is paid to maximize the viewing angle. The computer uses the RGBM algorithm, which takes into account the formation of micro-bubbles, and is the most evolved algorithm to reduce the formation of micro-bubbles without compromising the dive time. The push button is easily accessible to the diver and can be pushed even while wearing thick gloves. Navigating through the computer is a breeze. The three modes available to the diver are the Air, Nitrox and Bottom Time. The Puck gives the user the option to change the units between imperial and metric, decide whether the watch is in fresh or salt water, and the user can even turn off the audible alarms that sound when the ascent rate for the diver is too high. The maximum depth display for the Puck is 492 feet (150 meters). The Puck offers you an optional USB interface, which you can use to log the dive data onto your PC. The Puck has a precautionary program setting which allows the user to change each dive profile to more conservative settings, keeping into mind the body strength differences between divers of different ages. The Aeris A300 is very simple to use out of the box which will be suitable for the people who are just beginning to enjoy diving, and yet it has a motley of advanced features, which will suit the taste of the most experienced divers. The use of the Norm and Tech modes illustrate this fact quite well. The Norm mode is set as the default mode for the watch that provides all the necessary settings and information to the new diver who just wants to go for a dive and enjoy the scenery. On the other hand, the Tech mode is for the experienced diver who has the knowledge of the different settings and can fiddle around with the watch settings to tailor it to his/her needs. The three-button interface of the watch allows the user to easily go forward and backward through the host of settings available, including Dual Algorithm feature with Deep Stop, 2 Nitrox mixes and Audible Alarm. The high resolution tissue loading bar graph allows the experienced user to control their dive on-the-fly, while the red/green/yellow indicator makes it easy and intuitive to monitor the dive at-a-glance. The 3D compass of the Suunto Vyper Air Computer will quickly become your most-liked feature, thanks to its ability to provide a true reading, even if the watch is tilted at an angle of 45°. This will make keeping your heading underwater a breeze. The small and compact transmitter measuring at 3.15″ (80 mm) in length and 1.57″ (40 mm) is able to transmit information about the cylinder pressure to the wrist computer, thus eliminating the need for the traditional HP hose, which will make it easier for you to dive efficiently by streamlining the process. The Vyper Air uses the Suunto Deep Stop RGBM algorithm which offers nonstop decompression readings and an optimal ascent time. It provides audible alarms and notifications for the dive time, maximum depth, optional tank pressure readings, high partial pressure of oxygen, for quick ascents, violations of the decompression ceilings and when better gas is available. The ultra-bright high contrast full color OLED display on the Oceanic VTX allows for better visibility of the vital information being displayed on the watch. You can adjust the brightness of the watch display on-the-fly when a super bright screen is not necessary to provide the perfect clarity and to conserve battery life. The watch provides the user the choice between using Pelagic Z+ and Pelagic DSAT algorithm. Pelagic Z+ allows for a conservative approach to recreational diving or maximized bottom times for deep and decompression dives. The Pelagic DSAT maximizes dive times over multiple and repetitive dives. The Dual Algorithm allows you to sync your dive with your dive partner, making sure that neither of you would need to cut short their dive, even when different computers are being employed. The watch can wirelessly send dive data to a phone or tablet, thanks to the Bluetooth 4.0 technology present in the watch. Together with the DiverLog program in the iOS app, you can seamlessly transfer your dive log and remotely control all the computer settings and even add notes and other details from anywhere. The Research Dive Computer has large 2.4″ bright and clear full color display so it is easy for the diver to glance at the screen and see all the necessary information. The two-button interface of the watch allows for easy navigation of the menu, which changes according to the state. The watch features a digital compass, which is three axis and tilt compensated to provide with an accurate reading of the bearing. The Bluetooth communication scheme inside the watch allows it to communicate with PC, Mac, iPod and iPads with ease, making the process of transferring data a breeze. The watch also supports multiple languages. The different modes in the watch allows for recreational diving as well as lots of technical details for the scientist. The gauge mode displays all the data on depth and time and the resettable stopwatch function allows you to time your dive. The best dive computer watch for most people is the Cressi Leonardo Scuba Dive Computer Wrist Watch. Dive computers nowadays come with a host of different features, some with full color screens, others with Bluetooth technology to provide seamless communication between your device and the phone or PC, and still others with different algorithms to calculate the different parameters to keep you safe underwater. You now have the opportunity to select the watch at your desirable price point, and still get a watch which will have a host of useful features. So go out and enjoy your dive, and leave the process of keeping you safe on to the dive computer watch.